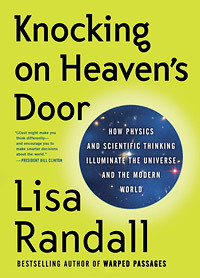 A review of Lisa Randall’s Knocking on Heaven’s Door: How Physics and Scientific Thinking Illuminate the Universe and the Modern World (Ecco, 2011). LISA RANDALL HAS BEEN JUSTLY APPRAISED by Time magazine as one of the “100 most influential people in the world” for her work in theoretical particle physics. From her position at Harvard University, she often travels: to the European Laboratory for Particle Physics, CERN, in Switzerland, where her theories are being put to the test in the Large Hadron Collider (LHC); to speaking engagements with professional and public audiences about her work in particular and the awe and wonder of science in general; and to rock formations where her chalked fingers can find ways to defy gravity. On the side, she writes popular books, such as her acclaimed Warped Passages1. At the time of this writing, eBooks occupy about 20 percent of sales space; that is, one out of every five books sold has no cover or binding save the faux effects offered digitally by the various eBook readers. Of late, however, a tiny and growing sliver of the pie is being carved out by audio books (primarily through Audible.com and iTunes), most unabridged and read by professional actors and readers. These provide a welcome alternative to those of us yoked to our iPods and MP3 players inside cars and gyms or on bicycles and hiking trails. Since fumbling around with cassette tapes and Sony Walkmans in the early 1980s, I have consumed on the order of 500- plus nonfiction audio books, so a measure of an author’s skill to communicate complex material clear enough to penetrate a multitasking cortex has become a mark of quality (or lack thereof). Many are called. Few are chosen. Randall’s explanatory prose places her among the elect. She is not alone, but she is rare among the many who have attempted the herculean task of explaining to us uninitiated the daunting science of theoretical particle physics. She devotes most of Knocking on Heaven’s Door to covering this science, along the way offering fascinating accounts of how the LHC was built, how the experiments are run, and, most notably, the engineering prestidigitation involved in teasing out nature’s secrets via energies never before witnessed on Earth. The book’s subtitle hints that it may be yet another long and tiresome treatise on science and religion, with either convoluted (and ultimately failed) attempts at conciliation or pugnacious left hooks and fast jabs at the faithful. Neither are Randall’s modus operandi. She states her case succinctly and moves on. Stephen Jay Gould’s “nonoverlapping magisteria,” for example, would work if only religions would stick to doing what they do best (providing aid and comfort to the poor and needy). However, conflicts arise the moment “religions attempt to address the external reality of the universe.” When they do, Randall notes, “[t]his leaves religious views open to falsification. When science encroaches on domains of knowledge that religion attempts to explain, disagreements are bound to arise.” As science expands its realm, the magisteria are becoming ever more overlapping. The deeper problem, however, is that if divine providence were on the offing, “it is inconceivable from a scientific perspective that God could continue to intervene without introducing some material trace of his actions.” In other words, if God did act in the world scientists would want to know how he did it. “Did He apply a force or transfer energy?” Randall asks rhetorically. “Is God manipulating electrical processes in our brains? … On a larger level, if God gives purpose to the universe, how does He apply His will?” Inquiring minds want to know. Religion has no answer. I know because I have asked many times. Knocking on Heaven’s Door came out before the faster-than-light neutrino experiment was announced2 and paraded through the press as an ostensible refutation of Einstein, implying in some circles that science is nothing more than one failed theory after another. Why thence should we believe anything scientists say about evolution, global warming, or vaccines? Randall ends her book with a thoughtful discussion of how science really works to resolve anomalies unexplained by the prevailing paradigm. Einstein did not overturn Newton; he just expanded on the physical properties of the universe at high speed and large scale. If you want to get a spacecraft to the moon, Newton will take you there. As flawed as it sometimes can be, science is still the most reliable tool ever devised for understanding the world. Few have captured this essence better than Randall in Knocking on Heaven’s Door. L. Randall, Warped Passages: Unraveling the Universe’s Hidden Dimensions (Allen Lane, London, 2005); reviewed in (3). J. D. Wells, Science 311, 40 (2006). This review was originally published in the November 2011 issue of Science magazine. This is an excellent review of what appears to be an excellent book. Even though the vocabulary level is quite a bit higher than I am accustomed to, it provided me with an unexpected avenue of approach into Lisa Randall’s world of advanced scientific concepts. Put in a fairly tight historical timeline, this story as presented by both the books’ author and reviewer reminds me once again of how fun it is to live in this extraordinary age. I have not read the book but I get the idea that through enlightenment brought by science lies our personal as well as man’s heaven.Scientific literacy is our guarantee that we will achieve modern bliss. since comments are turned off for Sherner’s article above on unknown unknowns I am making ths comment here. Apparently Mr Shermer is unaware of the ignorance of the analogy he made regarding the ratio of volume of a sphere to its surface area.mActually, since volume is dtermined by r to the 3rd power, and surface area to r to the second power it is clear that as volume increases the ratio of surface area to volume will rapidly decrease. Shermer states the opposite… that volume – as metaphor fro knowledge – increases the ratio for surface area – metaphor for ignorance – to volume increases. WRONG Mr Shermer… it is in fact the reverse… as every designer of a geodesic structures would happily point out. I was looking very highly on you, after your contest with Deepak Chopra, I saw the fear and jealousy in you very much ! The envy ! I am very sorry for myself that i was following you for many years ! Sorry for all your envy !